Trademark Attorney Charles L. Riddle wins UDRP proceeding, and the domain name has been successfully transferred to the Brand Owner. A client of Attorney Riddle, based in the Cayman Islands, had one of its service marks registered as a domain name by an unauthorized user. The unauthorized holder of the domain name was believed to be located in India. 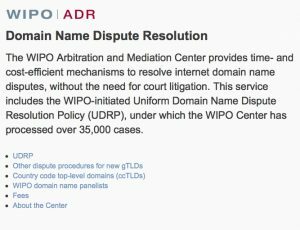 Attorney Riddle initiated a UDRP proceeding to have the domain name transferred transferred to its client. The UDRP decision was favorable and the requested transfer was awarded to the client. Counsel for RiddlePatentLaw.com and EsquireTrademarks.com represents parties on both sides of UDRP proceedings. Counsel has litigated against large multinationals, representing clients from the United States and other countries. Riddle Patent Law, LLC, has locations in the Philadelphia Pennsylvania Region, and works with legal associates to meet your needs worldwide.